LambdaStar UltraCap 9.7% is a new capsule suspension formulation of lambda-cyhalothrin that provides long residual control, the company says. LambdaStar UltraCap 9.7% is labeled for use indoors, including food areas, as well as for use outdoors, including structural, turf and ornamental as well as livestock housing sites. The powerful knockdown and extended residual activity makes LambdaStar UltraCap ideal for mosquito treatments. The capsule suspension formulation is ideal for extended control, even of difficult species like scorpions in tough, high-heat environments. Available in a 16-oz. 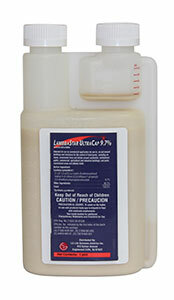 squeeze-and-measure bottle, LambdaStar UltraCap 9.7% features a CAUTION signal word and has low potential for user irritation. Registration is currently pending in California.